Dead Rising 4 released on PC this week alongside its Xbox One brother, and depending on who you ask it’s either sprinted like a 28 Days Later infected, or crawled like that dead lady in the first episode of The Walking Dead. With Metacritic ratings ranging between 40 and 90, it’s a real divisive play for reviewers. It’s also caused a bit of a ruckus here in the PCGamesN offices because it’s been a difficult little blighter to review. Looking for a great night with the undead? Try a fab zombie PC game. To do our detailed analysis of game performance for port reviews, I use three different pieces of software: FRAPS, Nvidia Shadowplay, and MSI Afterburner. But for the first time in the history of PCGamesN port reviews, none of these packages work with Dead Rising 4. While the game runs generally fine, it appears the Windows 10 UWP nature of the game means many overlay and analysis systems simply can’t play ball. I’ve managed to work around this by using a piece of software called Dxtory (and a lot more maths than usual! ), so our PC port review is present and correct as usual. But this already presents a problem for many gamers who use things like FRAPS to record footage for uploading to YouTube, or Shadowplay to stream on Twitch. Whether or not this situation will eventually be rectified is certainly a question, but at least at launch you should probably be wary. As mentioned earlier, Dead Rising 4 is a Windows 10 game, so you have to purchase or redeem a code for it through the Windows Store. This means you’ll need a Microsoft Account, which also needs to be registered as an Xbox account. There’s no way to run Dead Rising 4 without one; you can’t get past the game’s home screen without logging in. The advanced graphics settings menu provides 16 different options to tweak, albeit mostly through binary on/off choices. Available to adjust are key things like texture quality and filtering, shadows, ambient occlusion, volumetric lighting, and antialiasing. 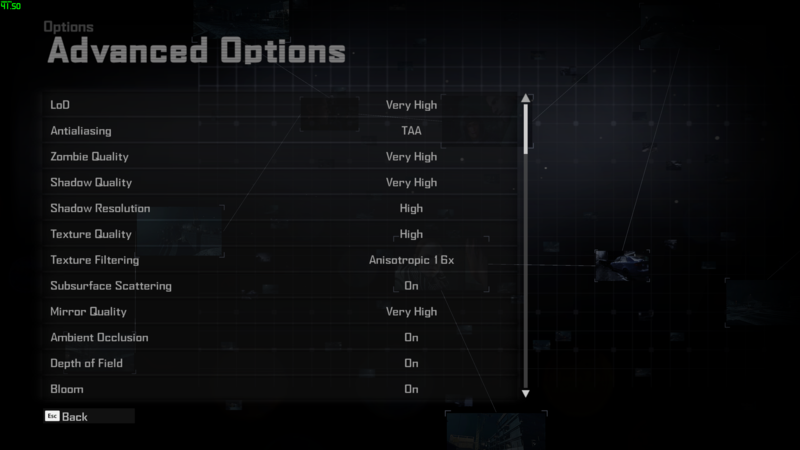 These can be selected individually, or changed as a whole with the presets system which offers very high, high, medium, and low options. In other menus there are options to fully remap the keyboard and alter things like camera sensitivity and aim assist. These latter things feel quite console-y, but do grant a solid level of control in order to make the game function as you’d like it to. Tested on an Intel i7 6700k @4GHz, 16GB of RAM, Nvidia GTX 1060, Windows 10. 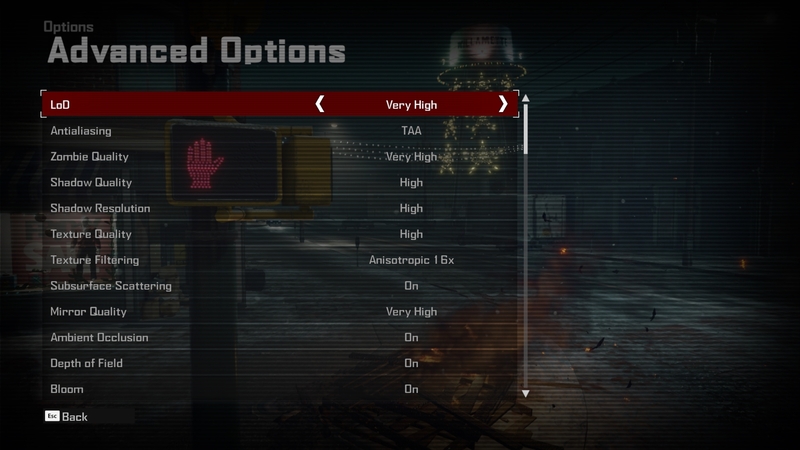 For our presets analysis we compare Dead Rising 4 on four different settings – very high, high, medium, and low – and see how the different presets affect graphical and performance quality. Dead Rising 4’s highest settings offer a reasonably crisp looking game, with suitably gooey zombies just asking to have their rotting innards splashed across the shopping mall floor. It’s nothing to shout about, but the crowds of zombies are as dense and creepy as you’d expect, and there’s detail to the world and characters. 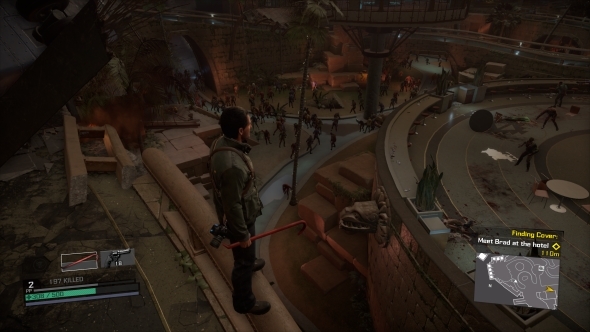 In regards to performance, Dead Rising 4 is quite a mixed bag. The frame rate shoots up and dive bombs quite frequently, depending on what’s in frame at any one time. 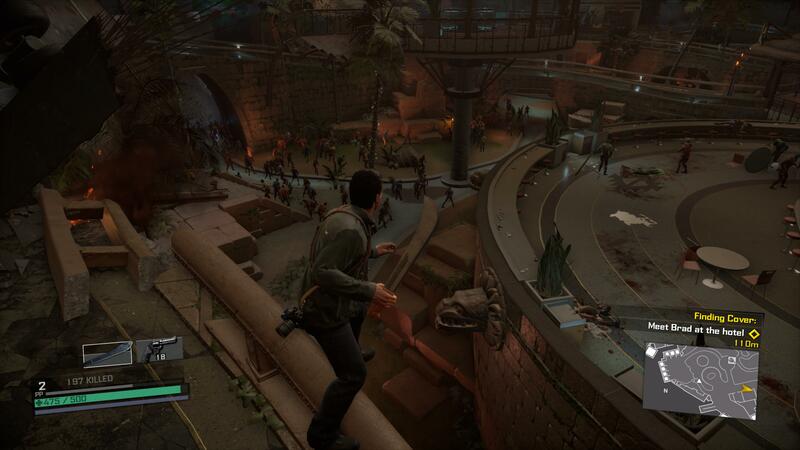 Interestingly it’s not the hordes of zombies that hamper it; on these very high settings I waded through a dense pack of them while hacking in every direction with a machete, and managed to attain an average of 60 fps. But the moment the draw distance is longer than the width of a normal room, the frame rate tanks into the mid-40s. And I’m not talking outside in a far-reaching city; this is simply looking across the plaza of a shopping mall. You’ll notice in the screenshot above that there’s no real noticeable difference between very high and high. After scouring the high-res images up close, there’s nothing I can point out that signals the change between the two presets. This is sometimes the case in a few games, but small adjustments can vastly improve the frame rate. It appears that is true here: there’s an average 9 fps gain by reducing the quality by an invisible smidgen. The same problems do persist through: long-distance shots pummel the frame rate, while close-up encounters with dozens and dozens of zeds does nothing but run buttery smooth. Weird. There’s a more obvious difference between high and medium. 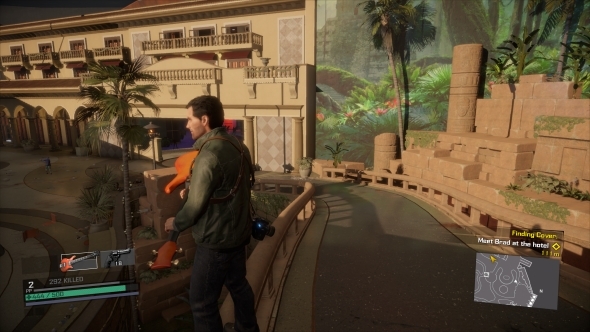 As you can see in this screen, the lighting is not quite as naturalistic, and it’s obvious that the anti-aliasing has been reduced (see those jagged edges between the palm tree leaves, for example?). Aside from that though, all three variants of the game so far are almost identical. This makes me think that the Xbox One fidelity of the game is pretty much what’s been used across the board for the PC version. It’s a bit of a disappointment considering many games receive graphical boosts on PC, such as Watch Dogs 2 with its fancy fog effects and bespoke post-rendering processes. Running at medium you can pick up an extra ten frames and run at an average of 80 fps, although the same old distance problems still remain. At low the most obvious change in quality occurs. In the screenshot above you can see that the lighting isn’t great at all, with a lack of shadowing visible under the curved bar to the right and in the hollow of the archway to the left. When there are dynamic shadows, they’re quite frankly alarming. They’re simply rendered as big, angular sections of black pixels instead of silhouettes. It looks as if retro Space Invaders are dancing on the floor beneath the undead. Shadows cast by the geography are less laughable, but equally poor. There’s also some simplification of assets; the palm tree leaves are now just big splotches of green rather than detailed models. A lack of antialiasing doesn’t help the situation either. Unseen in the screenshot is also the problem low has with rendering decals like signs; they only render in when very close, and they are incredibly low resolution when they do. In return you can play at around 99 fps, although the same caveats apply in regards to draw distances. For a quick comparison between the best and worst the game can look on these presets, take a look at the screenshots below. You can really see the differences in shadows and lighting here, which is the most immersion-breaking element of the low preset. 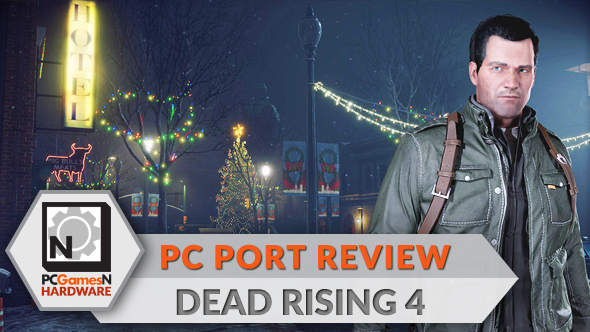 To see how Dead Rising 4 performs on different hardware, we have tested the game on four different graphics cards; two from Nvidia, and two from AMD. We’ve sampled from both the current and last generation of GPUs in order to offer the most useful information. Dead Rising has been put through its paces on very high settings, which turns all of the settings up to ‘very high’ quality, sets the majority of the toggle options to ‘on’, and uses TAA antialiasing and 16x anisotropic texture filtering, all running at 1080p. 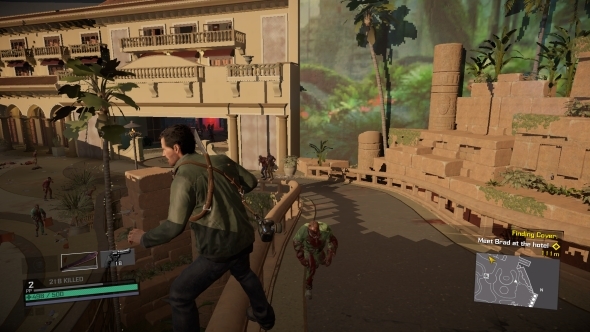 As you’ve already seen, this doesn’t produce an incredible image – it’s very much what you’d expect the Xbox One version to look like – but it’s as good as it can be. For the test we played the same two-minute section three times and crunch the numbers to find an average frame rate. 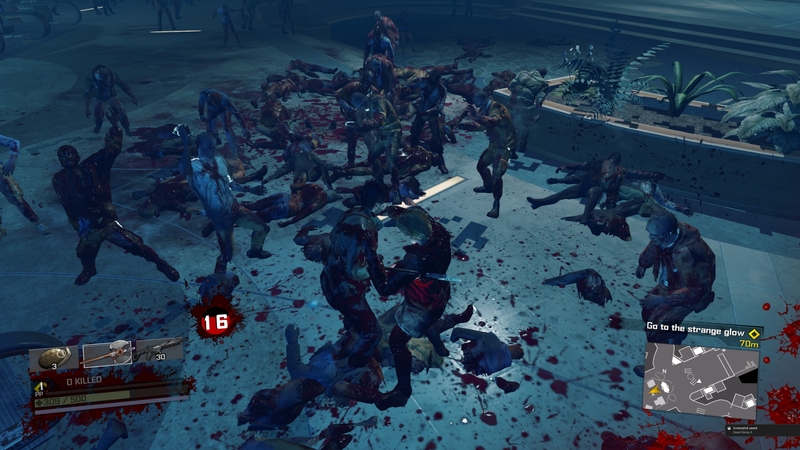 For Dead Rising 4, this involved wading through a horde of zombies and using a variety of melee and ranged weapons, as well as special moves. The process is repeated for all four of the test GPUs. Nvidia’s GTX 1060 is king, offering the demanded PC standard of 60 fps. Its lowest recorded rate is 51 fps, which means when the going is tough there’s only a nine frame loss. Not bad at all. It’s a similar tale for its older sibling, the GTX 970, too. Despite being last-gen tech, it keeps up with 53 fps on average, and drops to 44 fps in tougher times. 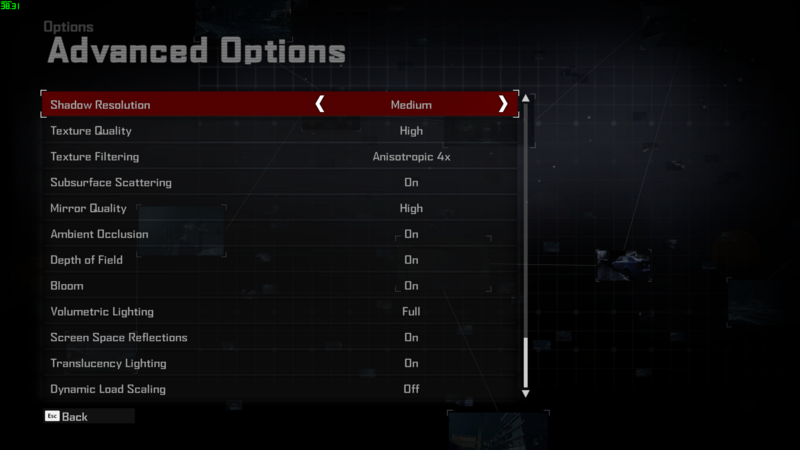 AMD cards suffer more notably. The last generation R9 380 GPU tops out at 43 fps, but does triumph in its consistency: it only drops as far as 38 fps, meaning a loss of just five frames. It’s not as sweet a report for the newer RX 470, though: it averages at 53 fps but can drop as low as 33 fps. The full data is even less kind to AMD: the RX 470 is quite sporadic, dropping low and jumping high frequently through the short test sequence. It’s certainly not unplayable, but it’s not a shining example of PC optimisation. It’s also important to remember what was discussed in the present analysis: the frame rate is pretty wild depending on where you go, and these results could have been much lower in a more open environment, even without the hordes of zombies. It’s difficult to get a concrete picture. To see the difference between areas in real time, take a look at the video above, which comes complete with a frame counter. If you’re looking for a completely consistent 60 fps and a good-looking game world, Dead Rising 4 really isn’t the game for you. Because of the fluctuations it’s difficult to find the perfect balance of settings. If you’re really concerned with frame rates it’s probably best to settle with medium or low presets, which help achieve rates high enough that even when they tank they’re still acceptable. If you’d rather have a better compromise, our guide will help you get 60 fps during heavily populated combat sequences. It’s at these times, when neck-deep in the rotting undead, that you’re going to want 60 fps as reliably as possible. You can achieve 60 fps on a GTX 970 with very little fiddling. You’ll need to first use the high preset, which as you can see in the comparison screenshots means you’re sacrificing next to nothing. Then you need just drop the shadow quality and shadow resolution settings down to medium, and you’ll be able to bash in zombie brains at 60 fps with no hassle. 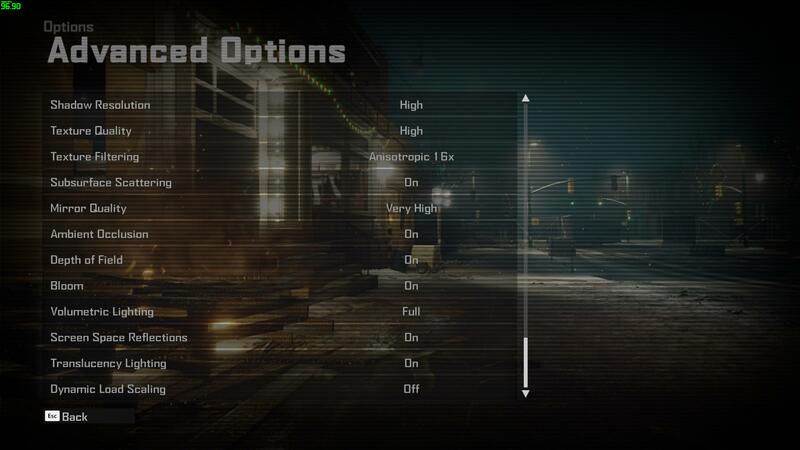 For a more detailed breakdown, see our GTX 970’s in-game graphics menus here and here. 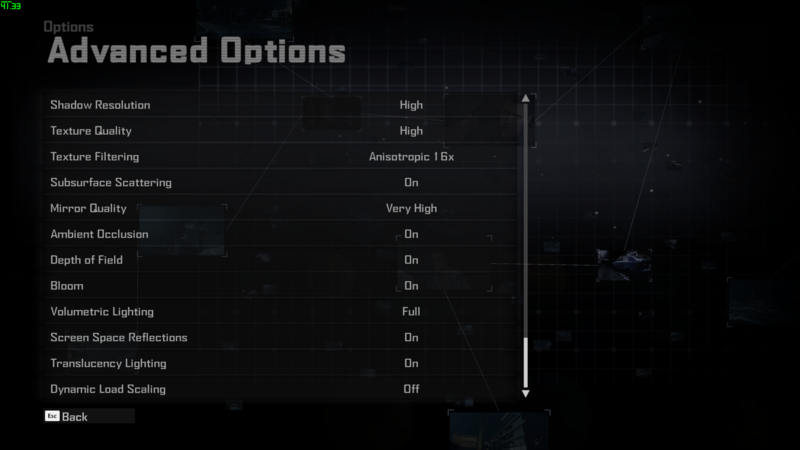 As noted in the previous benchmarks section, the GTX 1060 can run at an average of 60 fps on the very high preset, meaning you need not make any changes to the settings. If you want to help guarantee a even more reliable frame rate we’d recommend adjusting shadow quality and resolution to high. But that’s all the fiddling you need to do with Nvidia’s excellent Pascal-powered GPU. 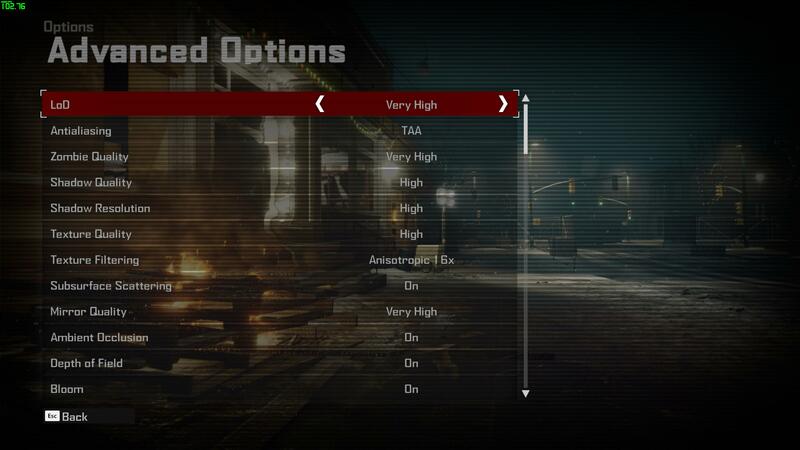 For a more detailed breakdown, see our GTX 1060’s in-game graphics menus here and here. The R9 380 is the card that struggled most in our benchmarking tests, and so the one that requires the most work in order to achieve 60 fps. It’s not a difficult set up, though: simply use the high preset, reduce both the shadow quality and resolution to medium, turn off ambient occlusion, and reduce the antialiasing to FXAA. Naturally the newer RX 470 is a more powerful card than the R9 380, and thankfully performs much closer to the standards set by Nvidia’s GTX 1060. Like that GPU, I recommend using the very high preset and adjusting the shadow quality and resolution levels down to high. More and more often these days we see PC games release a few days after the console versions in order to allow a little more time for optimisation. It’s understandable: there are countless thousands of PC system variations, and only one set up for an Xbox One. Dead Rising 4 didn’t have this time, and you can see evidence of that in a few areas. While it runs acceptably on PC, it does have serious issue with frame rate fluctuations. I’d accept these if Dead Rising 4 was a particularly demanding title, but nothing about it will ever wow you. It doesn’t look much like a PC game; at its best, Dead Rising 4 looks no visually more impressive than its Xbox One counterpart. And so, when running on an i7 processor and a GTX 1060, I wouldn’t expect the frame rate to bounce between 45 and 70 fps. 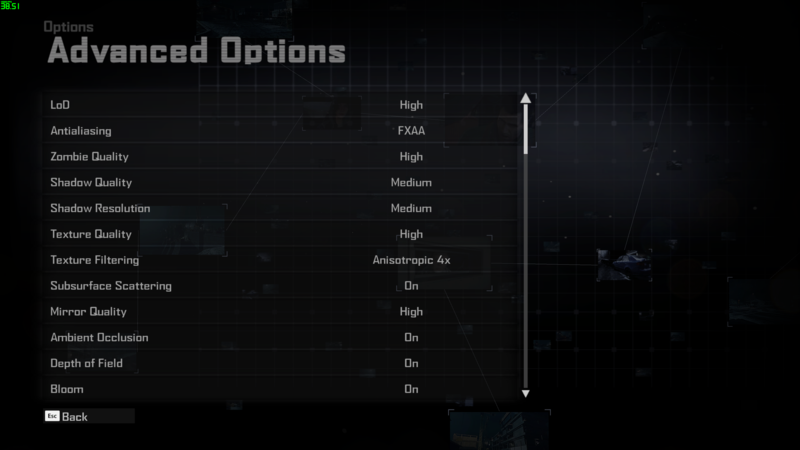 More confusing is the fact that these frame rate drops don’t happen when you’d expect them. It’s not the hordes of zombies that cause the drop, it’s areas with long draw distance. And we’re not talking huge scenes with endless zombies everywhere and city traffic; we’re talking the lobby of a shopping mall. It’s important to note that it’s not a disaster, though. Unlike Dead Rising 3’s abysmal PC port, Dead Rising 4 does run, and you can have a fun time straight out of the box. Just don’t expect anything magical. The resistance to FRAPS and Shadowplay is a weird one, though. If you’re a big streamer or YouTuber and had plans to share the game with your audience, it’ll take a little more work than you’re perhaps used to. The overall feel, then, is very much of a port. Yes, it works on PC, but it feels like an Xbox One game. That even extends to the way the game controls, which are a touch on the sluggish side. And if it feels like we’re playing on console, that’s not the sign of care and attention we’d expect in a PC port.